A.J. 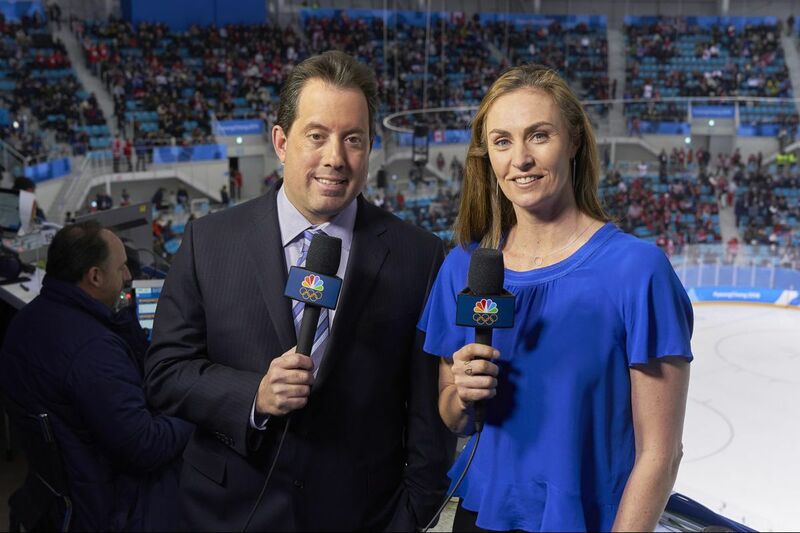 Mleczko jumped in after the Olympics (where she was paired with Kenny Albert, pictured) to do a Bruins game in March. NBC asked her to join its broadcast team for the Stanley Cup playoffs. So, you don't like hearing a woman broadcasting your major sporting events? Well, dude, you must have had a particularly bad weekend, because a woman was involved in almost every major sport televised over several major channels. That's nothing new at the Kentucky Derby, and the voice of Doris Burke has become increasingly familiar to fans of the NBA, opening a portal that people such as Kara Lawson have since passed through. Former Olympic and Stanford softball standout Jessica Mendoza has also continued her analytical work on ESPN's Sunday Night Baseball. The NHL on NBC? That voice you hear, if you have tuned into any of the second-round games between the Nashville Predators and Winnipeg Jets, belongs to 42-year-old AJ Mleczko, a former U.S. Olympic gold-medal defenseman-forward from Harvard who is somehow balancing the demands of raising four children ages 6 to 14 with a new career that she wasn't exactly seeking. One of her two daughters turned 12 during the series. "Missing the birthday was a little tough," Mleczko, who lives in Concord, Mass., said from her hotel room in Nashville. "If she's smart, she'll play on my mom guilt and get something really good." That daughter might not have to work on it as hard as she might have to just a few months ago, when Mleczko – who is still listed on sports-reference.com as a "stay-at-home mom" – limited her forays into broadcasting to Olympic years, and usually took her family with her as part of the fun. Even when NBC asked her to do a March 6 Bruins game, it hardly signaled a lifestyle adjustment. That changed, though, when the network offered her a choice gig alongside veteran play-by-play man Chris Cuthbert this postseason. With that, she became the first woman to serve as a television analyst for a Stanley Cup playoff game. "In all honesty, I don't think of her as a woman broadcaster at all," said Brian Boucher, the former Flyers goaltender who works at ice level as the other member of the team. "She's up there, it's like I'm doing a game with Eddie Olczyk. She's an accomplished hockey player. I look at her as just another hockey mind. And that's how I approach it." Said Mleczko: "Nobody treats me like I shouldn't be there, or even that I am any different." A.J. Mleczko (center) competed in the 1998 Olympics, where she won a gold medal with the U.S., and 2002 Olympics, where the U.S. brought home the silver. And as she points out, in some ways, she's not. Kathryn Tappen is a familiar anchor for NBC networks. Cassie Campbell, a Canadian who traded gold and silvers as an Olympic foe of Mleczko's in 1998 and 2002, sometimes moves from the studio and into the booth for Canadian broadcasts. Monique Lamoureux, who starred in the U.S. gold-medal victory in February, has done studio work for the NHL Network. Two of Lamoureux's teammates, Meghan Duggan and Haley Skarupa, have found occasional on-air work in their local markets as well. None, though, have the opportunity for instant analysis that Mleczko's job entails, or its inherent risk. Stating the obvious is an unavoidable byproduct of the job, but if it is rarely or never interrupted by salient observation, dullness and irritation are natural consequences. Complicating it further is the balance that must be struck between Boucher down inside the glass and Mleczko from above, turning the off-air producer of that night's telecast into what she describes as "an air traffic controller." Other than a few brief conversations during the Olympics, Boucher and Mleczko did not know each other until they were teamed together in the postseason. Their chemistry has been remarkable. "I love his perspective," she said. "What's funny is that at times, his observations will be of the shooter and I will come back with something about the goalie being off balance or not at the right angle. And I think it's because he looks at the shooter more because that was his focus as a goalie. And I look at the goalie because that was my focus as a shooter." That's not always the case. In Game 4 Thursday night, for example, Boucher detected that Nashville goalie Pekka Rinne had actually made a save with the knob of his stick. After several replays, Mleczko noted that it wouldn't have mattered if Predators defenseman Ryan Ellis had not taken care of Winnipeg's Bryan Little as he crashed the crease. "There's a cadence," Boucher said. "It's just a feel. And you get a lot of direction from the producers in the truck, letting you know what replays are coming up, who is taking what. There's a lot of behind-the-scenes in making a smooth show and not having us step on each other's toes. But it's been an easy transition simply because she's such a likable person. Actually, it's been a lot of fun." Mleczko is noncommittal about how long that fun might last, whether she's found another career . Missing that 12th birthday the other night was rough. There are two boys, 6 and 8, coming behind the 12-year-old. "I'm not sure I can answer that question," she said. "Right now it's the playoffs; it's exciting; it's unpredictable. And it's all I can do right now to just focus on these games and to be as prepared as I can be. I've been given this opportunity and I'm thrilled to be here and I want to be prepared. I want to come to the game every night ready to go and put my best foot forward. But looking into the future, I just don't know."